On a trip to Thailand last month, I spent a day at a cooking school outside Chiang Mai. While the cooking school, Cooking@Home, was all-together amazing (really! I never thought cooking Thai food could be so easy), it was the dessert that they brought out at the end which made me swoon. Mangosteen. Oh how I love these sweet, sweet fruits. If you haven't had a mangosteen before, you haven't tasted the most delicious thing to ever grace our beautiful planet. Mangosteens are so famously delicious that they've been proclaimed the "Queen of Fruits." Mangosteens play queen to the stinky durian's King. While some swear by the deliciousness of both, my tastebuds are ever after the queen. But you're probably wondering, what does mangosteen actually take like? I'll see if I can describe them without being too superfluous -- and without using the phrase "tastes like heaven." But don't hold your breath. Mangosteen may be encased in a hard outer shell but that's just to keep the pure goodness safely within. The best way to eat a mangosteen is to cut down the middle, without cutting all the way through. You don't want the fleshy inside to fall apart. Keep in mind that the outer shell is a good centimeter thick in most cases so it's quite tough. But the treasure inside is worth the patience in preparing a mangosteen for eating. Sometimes the fleshy interior will have a hard bit -- the seed. You can either eat this or not, up to you. But personally I would never waste even just a tiny bit of mangosteen, this god of fruits! They are a tropical fruit but in all my travels through Southeast Asia, I most often found them available in Thailand and Vietnam. It's popular to buy them in big bushels. Because really, once you eat one, you won't want to stop eating them. 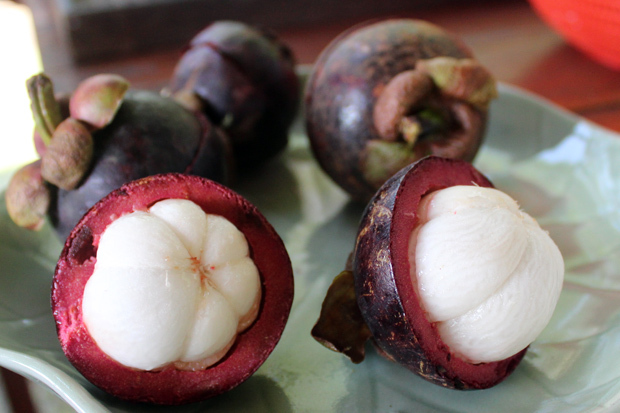 Mangosteen can be hard to find outside of tropical climates -- but not impossible. I've even on occasion found them at Vietnamese supermarkets here in Germany. Amazing! I don't know if mangosteen have any health benefits, to be honest. But with what I consider the most delicious fruit -- nah! the most delicious FOOD -- in the world, this is is the one thing I'm always on the lookout for. Mangosteen season usually begins in April or May in Southeast Asia. While visiting Thailand in April, I didn't necessarily see mangosteen at every fruit stall but it was relatively easy-to-find. We even sampled it as part of a Bangkok food tour.